Don’t try to change my mind about about winter vacation being overrated. You get sick, your friends get sick and then you exchange germs again when you think you’re able to reenter society. The holiday spirit would seem to be the perfect counterbalance, but with the get togethers and mad rush for gift giving, your available time for bike riding gets sucked up pretty quickly. Winters must be far nicer in Australia, but they have the Fourth of July holiday to contend with. I had high hopes too, but once Thanksgiving passed, the yearly routine started to set in. My parents set aside a couple of weeks to exchange colds which meant it was just a matter of time until I’d be done in. On the bright side, it hit me a week earlier than normal giving me more time to get into “race shape”, but really hit me square in the middle of vacation. I used to have a policy of waiting the sickness out, but since that system was putting me out of commission for a week anyways, I’ve been trying riding through it with some success. 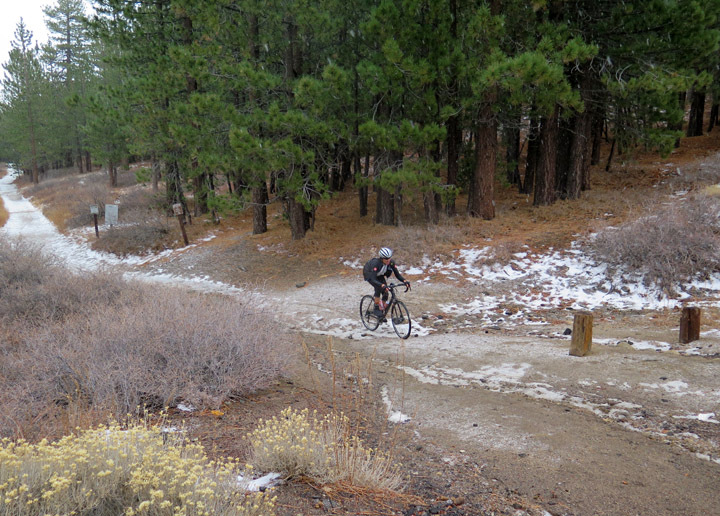 That’s why trying Mount Pinos seemed like a good idea at the time. There’s no business like snow business. Yeah, it was freezing and we abandoned more ambitious plans, but it felt like even though I didn’t sweat out the sickness, some damage was at least done. Of this things slowly and annoyingly worsened and by Christmas I was in full contagion mode. We cancelled a short family trip down to San Diego with a midweek sojourn to Paso Robles with another couple that also has a daughter of a similar age. While wine tasting isn’t my milieu, f’ing IPA’s have ruined my overall taste for beer, so I was up for anything. I brought my ‘cross bike along, the one with only a single water cage so that I wouldn’t do anything crazy. While I normally have no fear of waking up before the sun for rides, I had to trust the turned up signs that read “icy”. My ride the first morning was short not just because I was nowhere near 100%, but our accommodations were boxed in by busy roads. For the first time in my life, I rode directly on Highway 101, which didn’t seem as threatening as I imagined. 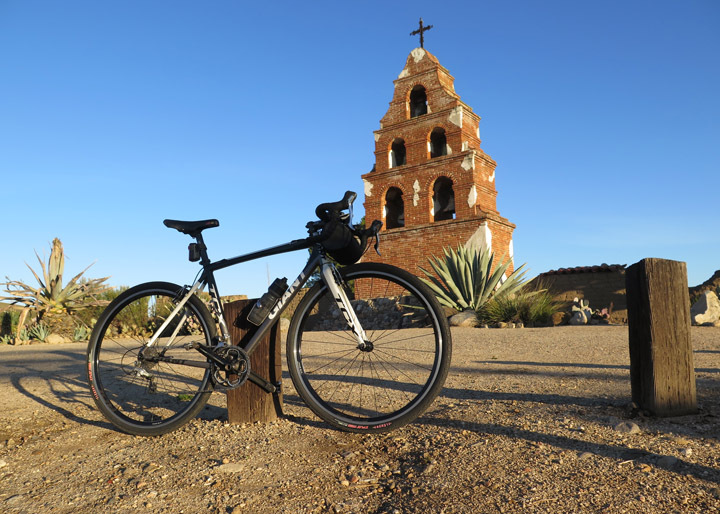 As a sucker for California history, I rode through San Miguel to have a look at it’s Mission and to view another town affected by a more modern freeway bypass. This isn’t me riding in Paso, just my wife shooting a pic from the passenger seat. 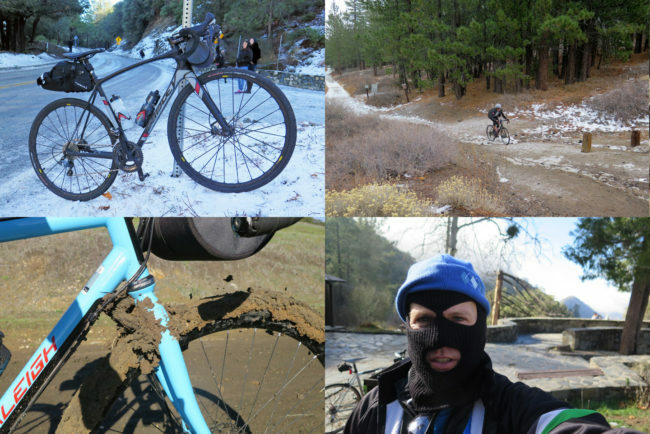 I got to ride some dirt roads on 40mm tires that was just as much fun as I hoped. We switched from a barn house to a hotel the next night because no one could sleep and instead of riding outside, I opted for a stationary bike at the gym. When we returned to the Gr818, I was able to get a ride in to up my fitness, but it typically takes me two days of riding for every sick day off to recover. That left me for the New Year’s Day ride which I had been looking forward to since I’ve ever gotten clip ins. My cold was pretty much over, but I was still coughing the last of it out which was limiting my lung capacity. I don’t know if the ride made me better or worse, but I’ll be fine to call it a wash.
A couple of days later, I had ambitious plans to bike up May Canyon to Magic Mountain. 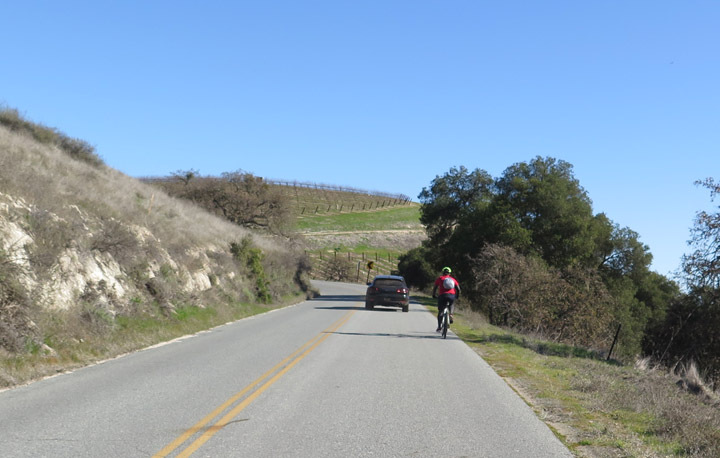 Call me a spring chicken, but I’ve never ridden that segment of the Santa Clara Truck Trail before. Don’t go past here. Trouble awaits. Things we running on schedule, but as I hit the Road Closed sign I heard a hissing sound. Never before had I ever wished this was someone else’s tires, but since I was riding tubeless, I hadn’t really prepared for this scenario. Taking apart the valve was a comedy of errors and that wild thought of bringing an extra tire didn’t sound so crazy now. I threw in a tube and held the tear with part of a cardboard box, but headed home on the closed portion of Little Tujunga because it was the quickest way back (sorry). 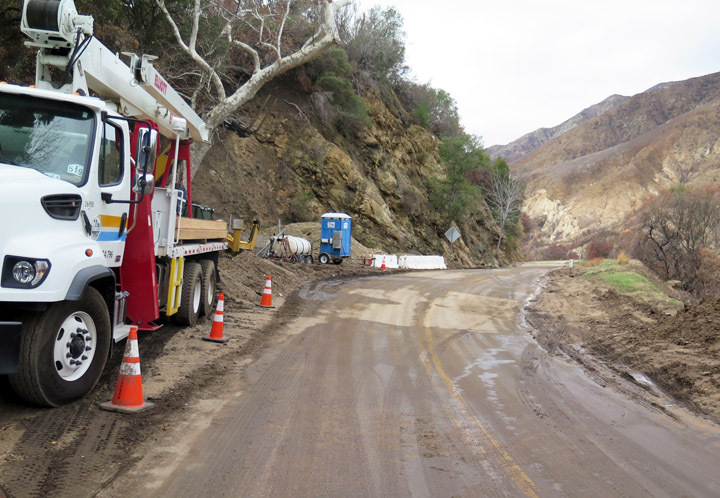 Crews had been removing this mud on Little Tujunga right before another storm hit. 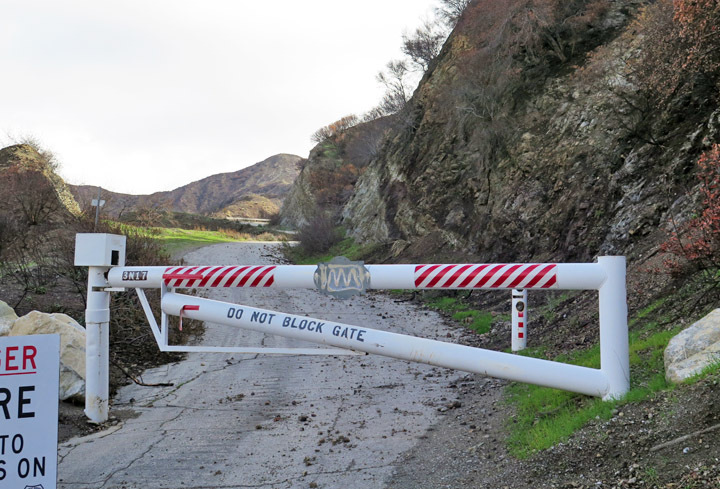 This road has been shut off for the past few months which has now been affected by a derivative of the fires: mudslides. It was a good thing we were on gravel bikes because there was no avoiding the mud. There were crews dealing with multiple trouble areas and with December being the rainiest month in six years, I imagine things will keep getting worse over winter. My one last hurrah was a short trip up the coast. 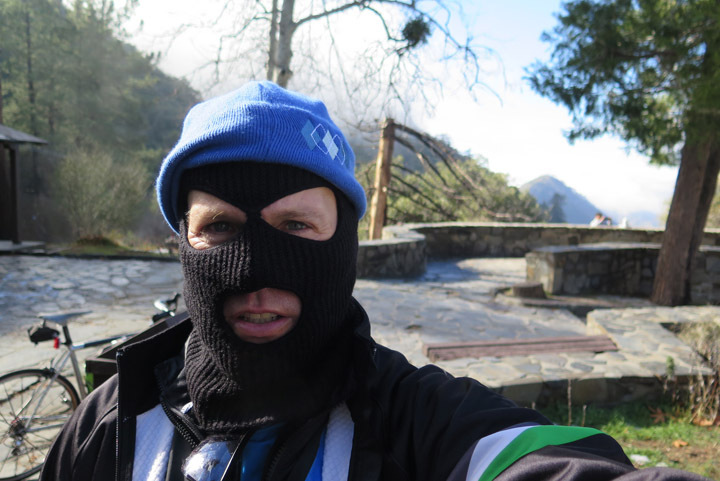 It was supposed to be a ride up Gibraltar with a couple of friends, but, you know. So instead, I took my steel bike out to Ojai for one last joy ride before I put the commuter racks back on. Sulphur Mountain seemed like the right thing to do since I now have an addiction to dirt and closed roads. This was my first time riding it, but it seemed like a tried and true route on Strava, so what could go wrong? Dirt can be therapy. Can…. It had rained the morning before, but I’ve had pretty good luck riding the day after meaning you can guess what happened next. 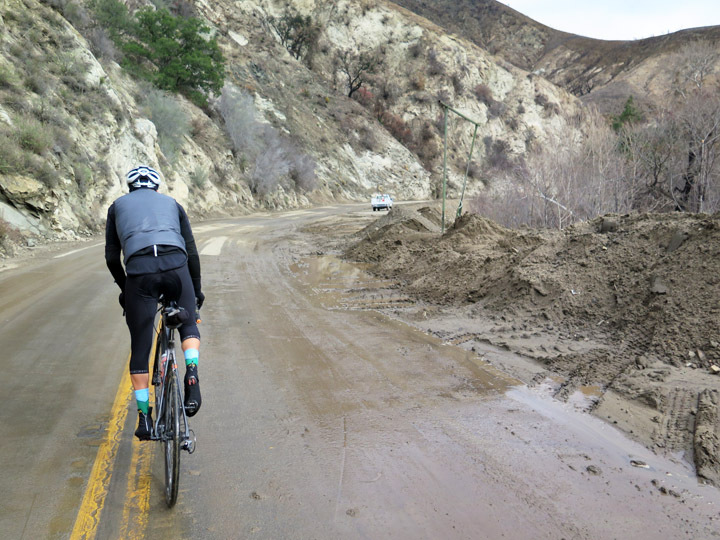 The first mile consisted of climbing up dirt that was in the last stage of drying out which is perfect to ride. As I ascended, conditions would get ever so slightly muddier, but I was able to trudge through even with cow chip sized morsels popping up all around me. 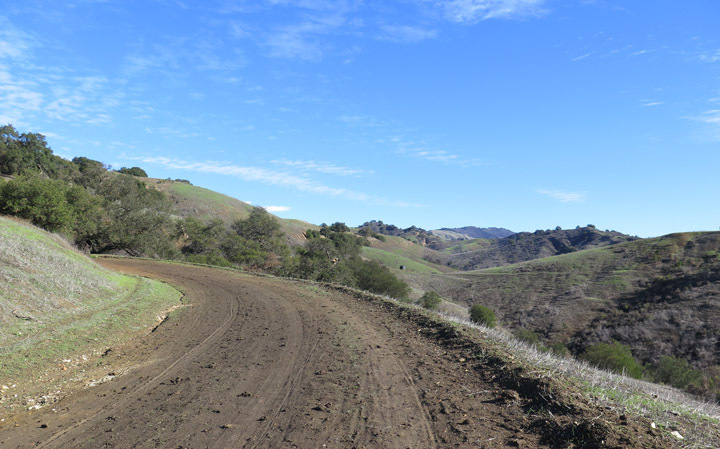 At about 2.5 miles up I reached the wide open space I was hoping for: views a plenty, direct sunlight from no trees and the end to my ride. This section which by eyeball science you would guess as being the driest was impassable. The mud had a sticky texture that kept getting jammed in my fork until I removed it. I tried carrying my bike a couple hundred yards to see if this was the worst of it, but I didn’t want to find out for another 6+ miles. With my shoes two inches deep in mud, I carried my bike until it was ridable keeping my head low with shame as I passed the hikers who I rode by earlier. This was my last free day of riding and once again I failed at it. I’m stuck in Ojai for a few more hours. Should I just count my prayers or continue to find salvation. You know what a cyclist would do….